"Well, we deserved a good ending. And we got it!" [caption id="attachment_82541" align="alignnone" width="800"] Why DID love put a gun in my hand? If you play the game, you'll get how hilarious I am. [/caption] April 26th has come and gone and now we have in our grubby little hands the newest installment of The Walking Dead: Michonne. It’s no secret that I’ve been underwhelmed by the first two episodes. I’ve been searching for reasons why I’ve not been in there as a story. My last review I wanted it to be more Fincher. I wanted the villains to have a motivation. I wanted something more. I wanted… I wanted what this installment gave me. Before I get to the meat of this game, let’s get the standard stuff over with. This is a Telltale Game. Quicktime events. Story focused. Sweet sound track. Voice acting. All that goodness. And it’s real goodness. I’m actually still nodding my head to the opening credits song. It’s awesome. Samira Wiley does a great job infusing Michonne with life. There is a moment towards the end of the game where I really felt the anguish that the character was going through. 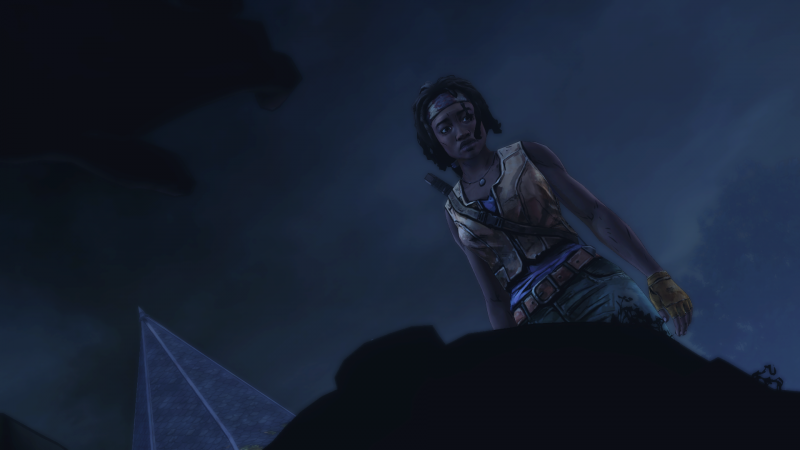 Also Michonne is the action star of the Telltale Walking Dead games. Episode three proves it again with a gigantic, massive, bloodbath. Tons of fun! [caption id="attachment_82538" align="alignnone" width="800"] Pictured: Action Hero[/caption] The game picks up right where the previous episode ended. You either killed bag of crap, or you didn’t. It does not really matter. Although, there is something to be said about the nature of Telltale’s niche and style. By letting the player direct the story, in order to achieve an end goal there have to be narrative points of convergence. Places where all your choices and actions fold back on themselves and you reach a single set of options. In this section for Michonne, any of the choices you made, the decisions to kill or not kill, they’re pretty pointless. Anyone you’ve spared in previous episodes is killed in this episode during the aforementioned bloodbath. And that, accompanied with my thoughts on narrative convergence took me out of the game, briefly. But only a little. It didn’t spoil the game for me. Also now that I mention it: happy belated spoiler alert! Look, Internet, I’m bad at spoiler alerts. If we’re going to have a relationship moving forward you’re just going to have to come to accept that about me. I’m sure we can work through this. So when I asked for something a bit more Fincher, how they rewarded me was by ramping up Michonne’s breaks with reality. The dark silhouettes of her dead daughters haunt Michonne all the way through this episode. They bring a creepy, surreal aspect to this adventure. You come to jump when the dark specters of Michonne’s past creep across the screen. I jumped. [caption id="attachment_82537" align="alignnone" width="800"] Aaaaand you would, too. [/caption] I asked also for a better motivation for the bad guys. I got that. Apparently the entire town burned down when Michonne escaped it last time. Here is something that I am ambivalent about. I guess fires did happen. I still think that the town probably could have spent a little bit of time fire fighting rather than chasing after them, but I’m picking nits now. I feel like my concern was addressed. Sort of. Quick plot rundown, Norma is coming to get her brother back, and this is not depending on whether or not you killed him, because I spared him and the group still felt like we were screwed because we messed him up something good. I even let my friend kick him in the ribs for good measure. But Norma has caught the ship’s crew and sets up a trade. You can see where this is going. The trade goes sideways, as narrative logic demands, and then there is a giant shootout, between zombies, people from Monroe and Michonne’s group. A fire happens. It is in this fire that we get to the point that the entire series has been leading to. 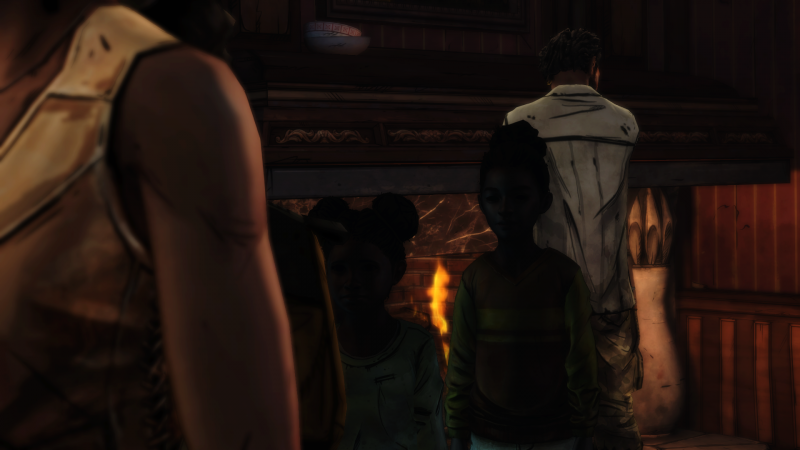 It was the necessary moment where Michonne confronts the daughters she lost. The series' action, purpose and themes were all balanced on this moment. Everything was heading towards the final flashback, the memory of Michonne’s last moments with her daughters. And the game pulls it off. I felt tingles at that scene. I felt Michonne’s pain. I spoke with a good friend of mine about how Telltale's Walking Dead games make you feel. He said to me, “That game literally made me care about taking care of a little girl. I was invested.” I’ve been pretty critical of this game series, but in that moment when they had to reach deep and hit that right note in both timing and performance and presentation, they hit it. I felt it. The moment where her daughters' faces come into focus for the first time… it was very, very strong. Overall, I do not believe the Michonne series was Telltale’s strongest work. I think they could have done a much better job overall with Michonne. But in this installment, they did what they had to do to close it out on a high note. I'm giving this a 7.5 because I liked how they ended it, and I got the feels, but it was almost too little, too late. All choices made in the previous installments are basically pointless. Some plot points are still kind of weak. There was some bugginess in the load times for scenes.